MODIS-Aqua image of July 16, 12:00 UTC of a new ice island forming from Petermann Glacier. The break-off point has been visible for at least 8 years in MODIS imagery propagating at speeds of 1 km/year towards Nares Strait. The fracture also extended further across the floating ice sheet from the northern towards its southern side. This event is still evolving, Trudy Wohleben of the Canadian Ice Service noticed it first (as in 2010) after reviewing MODIS imagery. Several people in several countries are monitoring and assessing the situation, but a first estimate of its size is 200 km^2 (3 Manhattans), I will revise this figure as soon as I got my hands on the raw data 120 +/- 5 km^2 or about 2 Manhattans. The Canadian Coast Guard Ship Henry Larsen is scheduled to travel to Nares Strait (and Petermann Fjord) to recover moorings placed in 2009. These mooring data, if recovered, will contain ocean current, temperature, salinity, and ice thickness data at better than hourly intervals from 2009 through 2012. UPDATE: For comparison, I here show the 2010 imagery on the same scale using the same processing and colors. There will be more imagery this evening as MODIS-Terra passes over the area closer to nadir (better resolution or sharpness of the images). Furthermore, clouds seem to be disappearing. The 2010 Petermann Glacier calving event also indicates the crack that broke off this morning as indicated. Note that the entire floating ice shelf moves by about 1 to 1.3 km per year, slightly less than a mile per year. The crack in 2010 is where the 2012 ice island formed. EDIT: Changed 2012 MODIS-Terra figure which now has the correct (July 16, 2012) date that the data were taken. This entry was posted in Ice Cover, Ice Island, Petermann Glacier. Bookmark the permalink. Hi, Andreas. Big news, eh? I’ve partly copied your post to the Arctic Sea Ice blog (and linked back here, of course). Thanks for all the info. Thank you so much, I am crunching numbers … this is a very worrisome event that will make our lives to get a ship recover our instrumentation more challenging and risky. I hope that this ice island will stay inside the fjord until we have safely entered and exited Nares Strait the first 2-3 weeks in August. I wish you all the luck in the world with that, Andreas, and will wish it again before you leave. Please keep us up-to-date. Will you be able to blog from out there? Can’t do field work without a little luck, although we always try to prepare for all eventualities, but with 3 years unattended operation of the moorings, we are pushing the limits, as one always does. While in Nares Strait we do have internet access for 1 hour/day at dial-up speeds, but I was planing to have daily-to-weekly updates with low resolution pictures. That’s the plan. We hope this 120 km^2 ice island, lets call it PII-2012 will stay inside the fjord until we leave the area about Aug.-18 or so. It is about half the size of its 2010 companion segments of which are scattered along Canada from Lancaster Sound in the north to Labrador in the south. We hope this 120 km^2 ice island, lets call it PII-2012 will stay inside the fjord until we leave the area about Aug.-18 or so. That’s a definite possibility. This year’s ice island has more miles to cover than the one from two years back, a large portion of which was stuck against Joe Island as well. This year’s piece looks more compact, so all of it might get stuck somewhere. Let’s hope it does. 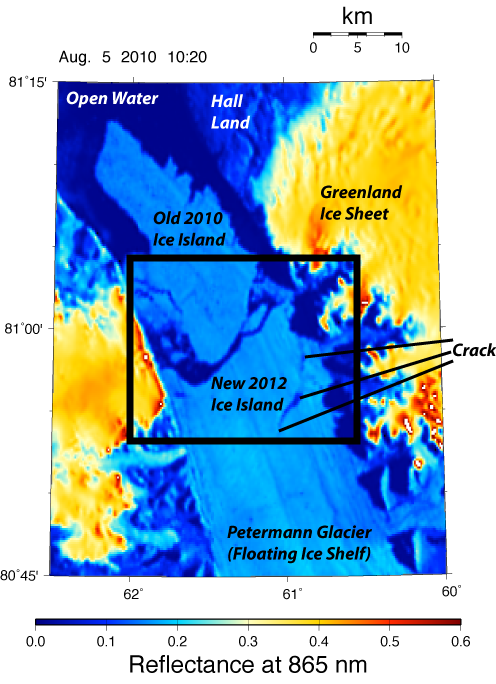 There is also a multi-year ice plug inside the fjord with first-year ice both towards PII-2012 and Nares Strait. Low-level winds have been strong and seaward, e.g., http://nares.oce.orst.edu/~cmet/nares/plots/plt_sfw_3_06.png but the wind stresses may be marginal to push such a huge mass of ice much. This is 2nd time this [removed name calling, AM] steal the glory, perhaps that is what is called scientific integrity! Actually, a group of us has been working on Nares Strait since 1997, and most actively since 2003. 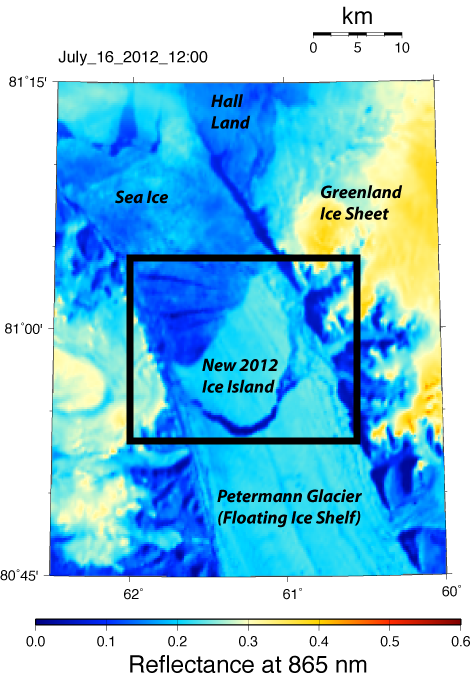 The Petermann Fjord story is published as Johnson et al. (2011) while a first cut at ocean warming is Muenchow et al. (2011). I certainly expected this during this summer but not until later in the summer. I hope this does not interfere. It is deeper in the fjord and an awkward shape for a quick exit I would thin. Mauri: Yes, I hope it will take its merry time to leave the fjord. Also, the new post on Petermann today does provide a link to both your 2008 and 2011 reviews of Petermann Glacier and its large cracks. Excellent work, as always. It has been hard to keep up with the changes. The high runoff has led to a rapid refill of one large periodically draining proglacial lake at Tiningnilik. The only HD footage of the 2010 Petermann Ice Island – taken only 2 months after its collapse – can be seen in the award-winning documentary, The Polar Explorer. This footage was instrumental in creating a new resolution about rising sea levels at COP16, the UN climate summit in Cancun. You can see the film here. It’s important to bring these images to UNEP and continue to chart its course to protect coastal communities that may be affected by it.